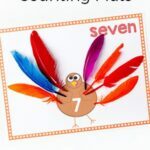 This feed the turkey counting game is a fun, hands-on way to practice counting, one to one correspondence and subitizing. It’s great for Thanksgiving! My son thought this math activity was so neat! 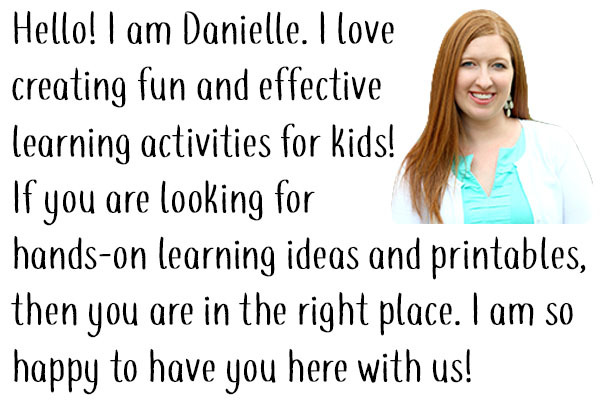 It was very simple to put together too. Part of the fun was going on a walk to collect acorns. My kids each brought a plastic baggy and they picked up acorns as we went along. 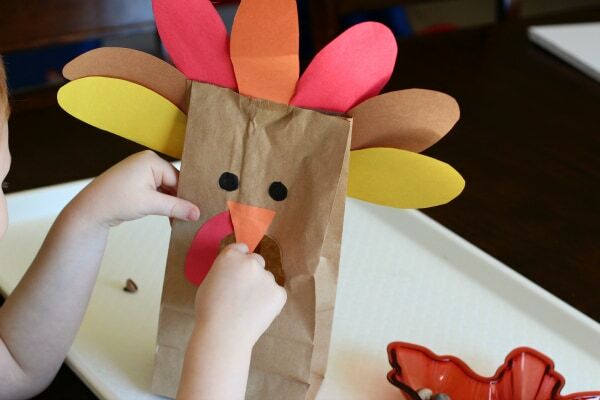 To be honest, we weren’t exactly sure what turkeys ate before doing this activity. I did a bit of research and found out that turkeys eat a lot of different things, but wild turkeys often eat acorns. 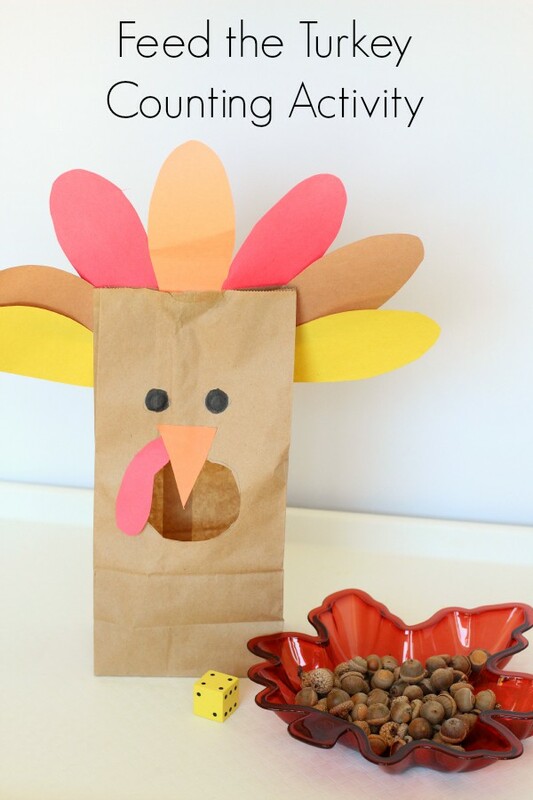 Since acorns are everywhere in fall, they seemed like the perfect thing to feed our turkey. 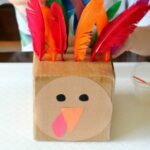 Check out this turkey feathers fine motor activity for even more fun this Thanksgiving! 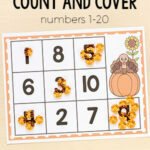 Or give these turkey counting mats a try. 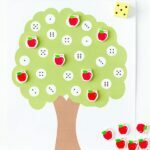 They go perfectly with this counting activity! Construction paper in brown, yellow, red, and orange. Cut feathers out from all the different colored pieces of construction paper. Cut out a beak from the orange construction paper and a wattle from the red construction paper. Cut a whole in the front of the bag. Draw eyes on the bag. Then glue on the beak and wattle. Glue feathers to the top of the bag. Evan was excited to see the turkey I made. 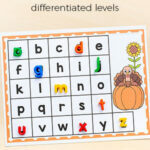 He immediately recognized that it was just like the feed the bear alphabet activity we did. I explained that it was just like that, but that this time he was going to practice counting. He rolled the die and then identified the number that it landed on. 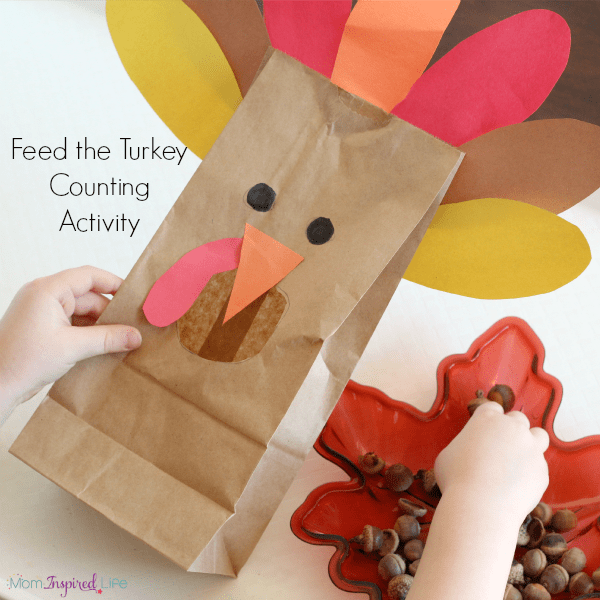 Then he would count out that many acorns and feed them to the turkey, one by one. At this point, one die is a bit too easy for him, so I plan to do it again with a pair of dice. He really liked it though! He had a great time feeding the turkey. 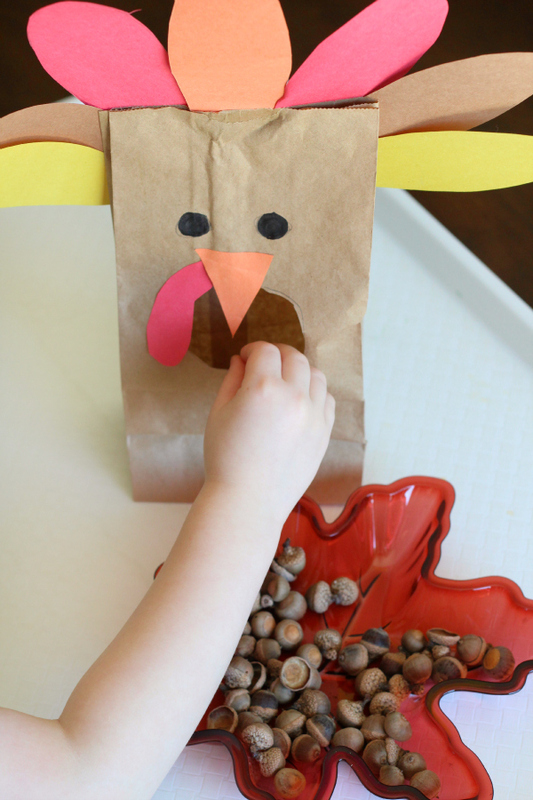 My two-year old loved putting the acorns in the turkey’s mouth too. She was very happy to put them in and dump them out over and over again.